This book looks ahead to consider the most likely results of the encounter between China and the international system. Environmental, cultural and perceptual matters are considered as well as more traditional economic and military issues. 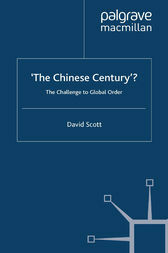 Underpinning the book is the question will the 21st century be 'China's Century', for China and the world? DAVID SCOTT is Lecturer in International Relations at Brunel University, UK. His pre-1949 China and the International System, 1840-1949, and post-1949 'China Stands Up'. The People's Republic of China and the Modern International System lead into this book looking at the 21st century - a trilogy.